Enter a new name if you like, by typing it into the box beside the words 'Node Predicate'. You can also set the node's heuristics and set the node to either a goal node, start node or regular node. Click 'OK' to create the node or 'Cancel' to cancel the node creation. Click 'OK' to create the node or 'Cancel' to cancel the edge creation. After creating an edge you will now see an arrow between the two nodes, pointing from the first node to the second node. 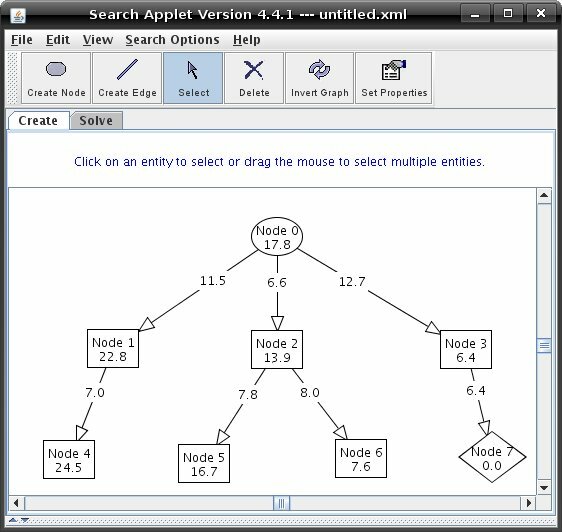 If you would like to set the nodes heuristics to be the distance from the node to the goal node, go to the 'Search Options' menu and click on 'Set Node Heuristics Automatically'. If you would like to set the edge costs to be the distance from the two nodes the edge is on, go to the 'Search Options' menu and click on 'Set Edge Costs Automatically'. To view the node heuristics or edge costs on the graph, enable the "Show Node Heuristics" or "Show Edge Costs" check boxes under the view menu. 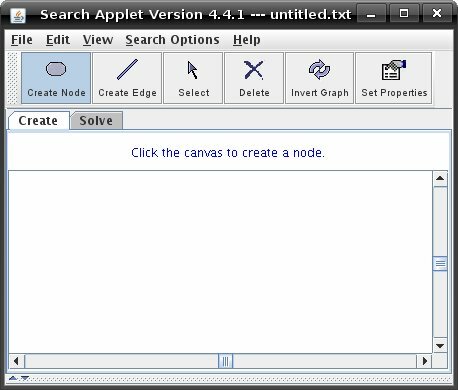 To learn how to solve a graph, see Tutorial 3 on solving graphs.